This is a must read for anyone who is enthralled with the stylish set. 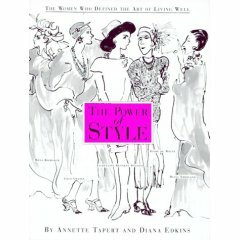 "The Power of Style" by Anette Tapert and Diana Edkins profiles 14 different women who are considered the style icons of the 20th century: from the likes of society princess CZ Guest to former Vogue editor-in-chief Diana Vreeland, to darling of the media/paparazzi Jackie Kennedy Onassis. This book definitely gave me perspective. You'd be surprised to find that beneath the posh and polished exterior of these stylish women, lie a turbulent and sometimes even tragic persona. Irrational, spoiled or crazy, as most of these women seem, I cannot help but pity them for the melodrama that is their life. From tumultuous marriages brought about by infidel husbands to bouts with alcoholism and depression, they seem to have led complex lives that cannot even be assuaged by the privileges their glamorous lives afforded them. And that is, IF they managed to maintain their lifestyle. Some of these women had to pawn their jewels in their old age, leading a life that resembled a reverse fairy tale. From princess to pauper. A tragic story indeed. But a great takeaway from the book (apart from the juicy gossip) is the fact that beyond each woman's expansive wardrobe and her styling life, is an individual whose pursuits overshadow her interest in clothes and jewelry, accessories and make-up. Often portrayed as flighty and shallow, these women have in fact devoted their energy to causes they believed in, no matter how controversial (i.e. Coco Chanel's Nazi leanings). Love them or hate them, they have made their mark. Come to think of it, the fact that they were able to elicit a reaction from you means that they have in some way, affected you. That is the Power of Style.